We just learned about the Maxillary First Molar. Another tooth is the Maxillary Second Molar. 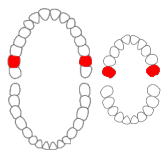 These ones are just like the Maxillary First Molars, just further back on the jaw. They have 4 cusps, and they work to help grind up the food. Some people get another row of teeth behind these, but for other people these are the last teeth in the mouth.